Automated retail has become more prevalent in the shopping community and successful companies are increasingly taking advantage of the unique opportunities it presents. Self service retail isn’t new; consumers have enjoyed the conveniences of making a quick transaction at the ATM or getting their movie tickets from a self-serve kiosk to avoid long lines or slow customer service. Poor customer service has always been unacceptable, but today's customers have higher expectations and very little patience. Moreover, the world is more connected than ever through social media. This makes it increasingly easy for companies to quickly develop a bad reputation through no fault of their own simply due to a single customer's bad interaction with an employee. Companies are turning to a new sales and marketing solution, automated retail kiosks. These can be placed in non-traditional locations or within stores, with the goal of selling products where the customers are, instead of bringing customers to you. Aside from extending the retailers reach, it provides customers convenience and instant gratification. You may be asking yourself if it would be wiser to install an automated retail unit to promote and showcase a new product, or hire staff/brand ambassadors to help with this promotion. This is a different solution to consider vs hiring the traditional promotional staff. Here are 5 ways self-serve retail kiosks can be more effective than the traditional methods when introducing new products, extending your brick and mortar store presence and promoting your current products. The cost of training and maintaining staff through turnover is not easy. You are not guaranteed consistency in terms of quality employees, or long term staff. Investing the monthly ongoing costs of hiring an employee would more than cover the cost of running a machine. With a retail kiosk, you end up with a premium custom retail machine which will consistently highlight your product and attract customers. Employees have more of a potential to miss key product information or selling points and don’t always have the drive to grow the brand. Often the customer has more knowledge about particular products than the staff member. An automated retail machine is fully programmable and displays the language, presentation and imagery that your brand wants to communicate to your target market. With full control over presentation and user experience your brand messaging will remain intact. A WOW factor is hard to replicate with staff. Even with an outstanding customer service experience, there is no attention drawn to the experience and very little to take away from it. A well designed automated retail unit with a large glass front and premium lighting immediately puts the spotlight on your products whether the unit is within your store or at a remote location. 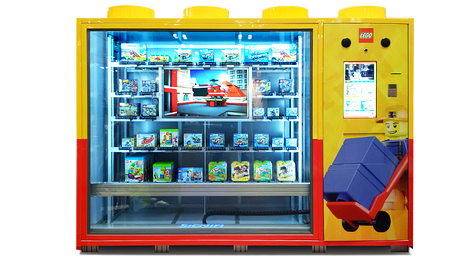 Imagine for instance, a prominent LEGO machine inside Toys ‘R Us. The innovative aspect of this unit draws attention and focus to LEGO, and when a purchase is made, the excitement of watching the robotics move and deliver a toy creates the WOW factor that keeps the consumers attention on the brand. While there are other security measures in a store, most of the time an employee is the last line of defence when it comes to theft. Not all employees have a keen eye for spotting theft and may not be well equipped to deal with that situation. The solutions for loss prevention in a retail environment are not foolproof or customer friendly. All of your products are protected securely behind high quality glass and come equipped with advanced security locks, alarms, webcam and more. These types of measures ensure your inventory numbers will remain intact and are precisely accounted for. No need to set up and dismantle, the unit is your marketing machine. The perception a lot of customers have of employees is the archetypical pushy sales-rep. Perception is reality and even if the employee is not working on commission, consumers can feel pressured and you can lose the sale. Todays customers are well informed and very comfortable with self service, in fact studies show that more than 60% of people would rather not speak to sales staff. Customers enjoy the empowering self-serve option that puts them in control of the sale. They have all the access to the product information provided on the screen if they haven’t already researched it themselves. Customer service is becoming more of a target for consumer criticism and has lead many frustrated retailers towards exploring new and innovative ways to interact with customers. More businesses are discovering the increase in revenues and the lower costs of selling through automated retail kiosks. Contact Signifi Solutions to see how we design a unique automated retail solution to help your company meet the changing needs of consumers.